How would you like your hair and makeup artist to come to your location of choice for all of your beauty needs? Every bride deserves to be pampered on her wedding day. Kathy Smith and her talented team of makeup artist are available to travel to your location for wedding day beauty. Whether you choose airbrush makeup or select brands like Lancome, MAC, Bobby Brown, Chanel or your own personal makeup choice, Kathy Smith and her artists will work with you and each individual in your bridal party to create unique looks that enhance the already present natural beauty. Using the Dinair Airbrush techniques to apply makeup, Kathy will provide you with the flawless finish that requires no touch ups throughout the day. Her knowledge of the best techniques in makeup application will have you photo-ready to create those lasting memories caught on film. Along with over a decade of experience serving Houston area brides, Kathy Smith also has Nicole Settle working among her team of talented makeup artist. Nicole has 15 years of beauty know-how in the Houston wedding and beauty industry. Her communication with you helps to put you at ease before the first brush touches your face. Her signature finished look is a sunkissed, natural style. 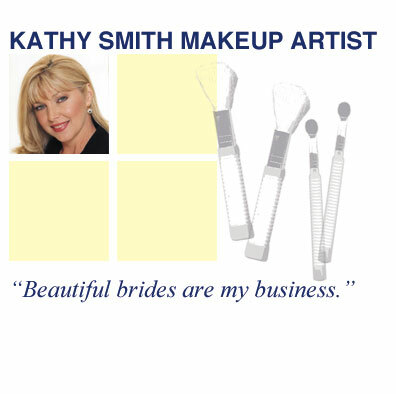 Kathy Smith and her beauty team strive to keep your special day stress free, from the time they arrive and begin wedding party makeup until they finish putting the veil on the bride. One look through the online portfolio of Kathy Smith and you can clearly see the pride and dedication put into making each bride look unique and naturally beautiful. Start your beauty journey today with Kathy by scheduling your wedding hair and makeup consultation. Kathy and her team love hearing from brides so feel free to contact them with any questions or comments as well.